Charlie Bears Brock Discounts Apply ! Brock is fully jointed and hand finished in black, white and grey 51% Mohair and 49% Alpaca. Brock wear's a necklace with a leaf on, as a memory of the woods and with his long tail he is a lovely woodland creature. Made of the finest schulte mohair and alpaca and glass eyes made in the UK. 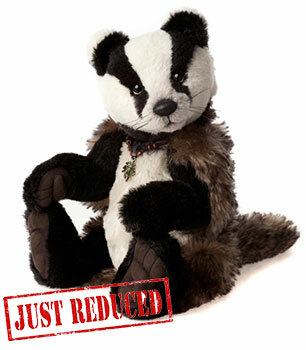 I love my Brock the badger. Amazing detail, and mohair.